what was that you said son "you just riped the rubbing strip of the transom"
"it was the best butter"said the mad hatter. Add To Ignore List Phew!!!!! 38 years 60 odd boats, never the same one, are you mad? cannot remember what happened yesterday. bye the way what day is it. one day this boat will be mine dream on!!!! One of these decades we WILL finish Broad Ambition !! Oulton Pearl (V255) from Newsom Boats, Oulton, now under a different name but still on hire, i think. Crystal Heart from Hearts, not sure if she is still around. Starfire from Alphacraft, still going strong. Silver Magnum 2 from VIP Harvey Eastwood, now in private hands. Fair Entrepreneur from Faircraft, now operating from Woods. Golden Oriel, an Elysian 34 built for Cliff Richard, from St. Ives, not sure if she still exists. Sundancer 1 from Bridge Boatyard at Ely, still on hire. Plus various day boats, etc. "Darling, where is that water coming from?" Add To Ignore List Can't remember the names of the boats that we hired as a kid but remember going to Herbert Woods twice in the early 80's (one motor cruiser, one yacht), amd Maffets in Loddon once in the mid 80's. Now I am taking my family we always have Flickering Light from Herbert Woods (Page 95 in the hire boat reveiws I think, maybe one or two either side). Perfect for the family of four, you can leave all the beds made up and the kids get seperate cabins. 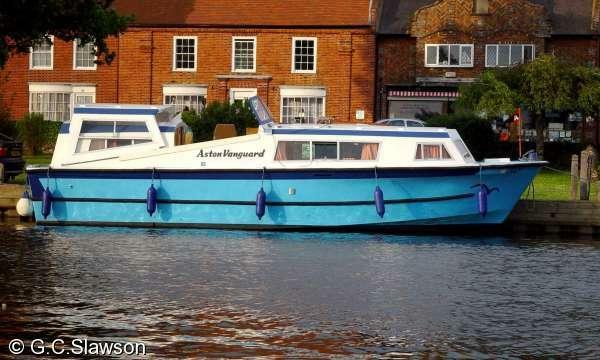 Would you beleive there is only one other boat like this in the entire broads hire fleet, San Carlos at Richardsons.